Originally I'd not been planning to do a groundhop on this date, as I was going to go to Wycombe's home tie with Bristol City in the Johnstones Paint Trophy. Though I had been slightly open to doing an alternative, as Wycombe were asking £12 entry. Hardly the kings ransom, but when I considered that my season ticket works out at £10.50 a game and that a lot of other clubs like Peterborough were letting in fans for a fiver, for what is essentially a reserve team competition, it seemed a bit much in comparison. But nonetheless, pre game on Saturday, against Burton Albion, I was expecting to be at Adams Park on the night. But a very poor Wycombe performance changed that. We didn't have a serious shot on target till the 83rd minute when we scored our only goal of the game. We then had a late rally but never really looked like equalising. And it would have been daylight robbery on Burton if we had have done, given how the game had played out. We missed Dean Morgan who was out, and Ainsworth resorted to playing Jo Kuffour, who is probably one of the poorest players that I have seen in my time watching Wycombe. You certainly can't fault his workrate and effort, but his goal ratio and general play say all you need to know. It wasn't much of a spectacle as a game either. Much like when we met Mansfield in August, there was little attacking intent from Wycombe. I can take (and enjoy) something like a 3-2 defeat where we go for the game, but on these occasions we had just sat back and resorted to hopeful long balls up to a very short forward line. I texted Anwar during the game, and he agreed to doing a groundhop, and so I looked in the non league paper for a game and 2 stood out. I'd have preferred to go to Coalville Town v Stratford Town, due to Wycombe having played them in the FA Cup in 2004 and it had been on my radar for a while. But Cirencester was nearer and therefore a bit cheaper, as well as the fact that I had an early start as per usual on the Wednesday after. I'd not seen Cirencester play before, but I did recognise one name on their teamsheet. Former Leyton Orient keeper Glyn Garner had played on my first ever visit to Craven Cottage, where Leyton Orient gave Fulham an almighty shock in the FA Cup 3rd Round as they won 2-1 against the Premiership side. That was a trick that Wycombe repeated a year later in 2007, on their way to the League Cup semi final. I'd also been to the ground for pictures before, though I don't recall getting inside, so it would be nice to return for a proper game. Didcot on the other hand, I had seen play a few times. A youthful Wycombe side had edged past them in the Berks and Bucks Cup in my only visit to their home ground in 2008. I had also seen them lose at North Leigh late on last season, but more recently I had seen them triumph over local rivals Wantage Town in the FA Cup. It was no easy task, with Wantage top of the Hellenic Premier and Didcot bottom of the Southern League Division 1 South and West, but they prevailed 3-2 in an entertaining game. But their poor league season continued, despite success in the cups with them still in the FA Cup at the time of the game too. They had former Wycombe youth teamer Stuart Cattell in their side, who can play in either defence or midfield. I was off as usual on the day of the game, which was just as well. I had been busy at work, doing a 13 hour shift and 11 hour shift the two previous days. It was pretty tiring and what with working in a supermarket, that is when some of the daft questions that come from customers get on your nerves. But you have to be polite and put a happy face on, no matter how tired you are. I went down town with my Dad in the morning then spent the afternoon relaxing before leaving for Aylesbury at 3.30. I had a quick look round Aylesbury and then picked Anwar up at 4.50. The journey was pretty much the same as when we went the same direction last time to Bishops Cleeve. Pretty much problem free apart from a 25 minute delay on the roundabout near Witney on the A40, where it always seems to be clogged up during busy times. We got into Cirencester at 6.40 and went into town looking for food. I was pleased to see there was free parking, which is unusual in towns, usually they try to bleed you dry, even in the evenings. We had a look around, but there didn't seem to be a great choice of takeaways, only spotting an Indian and a fish and chip shop. As I had Indian the past couple of times, I opted for the chip shop. It was called The Friar Tuck and was a bit disappointing to be honest. The portions were small for what they cost and the chips were all soggy. Also the Gloucestershire Sausage I had was nothing different to the usual fare you get in chip shops, though luckily it tasted OK. And the service was pretty slow, taking 15-20 minutes to serve a queue of 4 people, despite lots of people standing round doing nowt. We got to the ground about 7.20. I paid to get in and also bought a reduced size programme for 50p. I was quite pleased with this. Although it was photocopied, it still had the info you needed in it. Enfield Town charged me 3 times that recently for a thinner programme littered with errors and not much to read. Probably printing a full blown one meant that they would have lost money, so this was a sensible option. I went round the ground getting some pictures and checking Facebook before the game kicked off. The game had quite a bit of time added on, and it wasn't till 9.45 that we left. During the course of the evening, we had been following Wycombe's JPT game against Bristol City and were both pleased to see that Wycombe had won 2-1 and put in a good performance by all accounts. Matt Bloomfield had scored in his first start in over a year after a long injury layoff, so that added to the good news. I tried to get BBC Radio Bristol on in the car to hear their side of the story, but we were a bit far away to pick it up. We made do with Radio Wiltshire, where Swindon fans were still downbeat despite winning. It was nice to hear them read out some non league results too. After an easy journey home, I dropped Anwar off at 11 and got home myself just over 20 minutes later. I checked Facebook again, stayed up for an hour watching TV before going to bed. Ciren kicked off playing towards The Shed end and immediately looked more positive than the previous game moving the ball around the pitch with purpose. 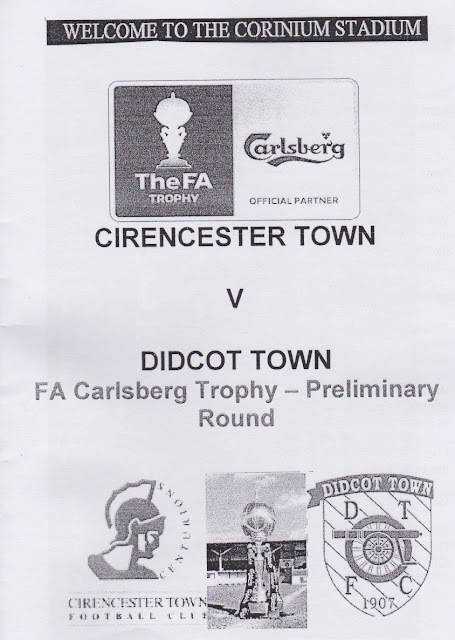 Such was their dominance it took until the 15th minute before Didcot managed their first shot at the Ciren goal which was well wide of the target. In the 17th minute Shayne Anson crossed the ball from the right flank into the box and surprisingly it was James Mortimer-Jones who popped up to head the ball over the bar from around the penalty spot – this later proved to be rehearsal. A couple of minutes later Brad Hooper headed a ball from the edge of the Ciren penalty area, left of centre, into the path of Lee Smith. Smith ran at the back-peddling Didcot defence and played a well weighted ball, between the right back and centre back, for Steve Davies to run onto. Davies’s early shot, as he cut in from the left wing, was saved by visiting ‘keeper Kieran Beesley with his legs. Almost immediately afterwards Sean Wood collected a ball some 30 yards out, right of centre, and fired in a fierce shot that Beesley did well to tip over the bar. Around the half hour mark Didcot enjoyed their first sustained period of possession and during this, in the 33rd minute, they were awarded a free kick on their right flank. The ball into the box was laid back by Louis Joyce to Luke Carnell on the edge of the penalty area but the centre back blasted the ball over the bar. 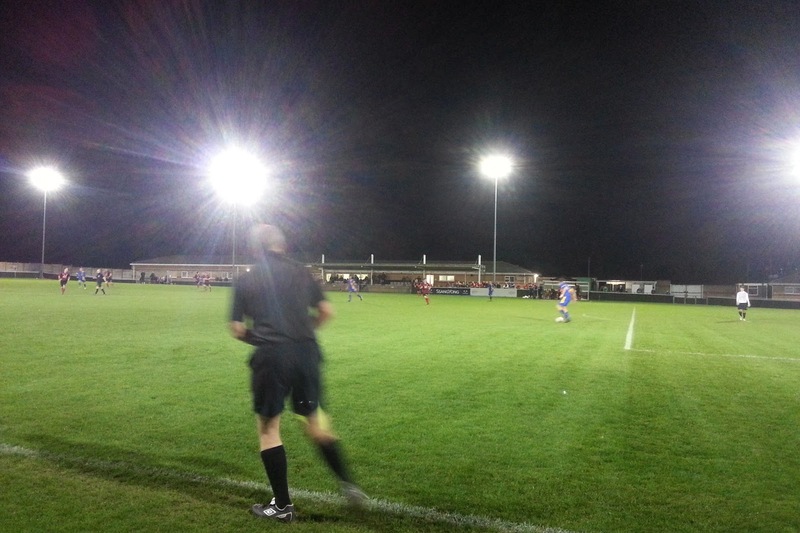 Almost immediately from the re-start Didcot were awarded a corner on their right flank. Left back Taylor Janes stepped up to take the kick and having seen this move on Saturday (it produced their goal in the opening two minutes) Cirencester goalkeeper Glyn Garner was ready and he punched the ball clear. 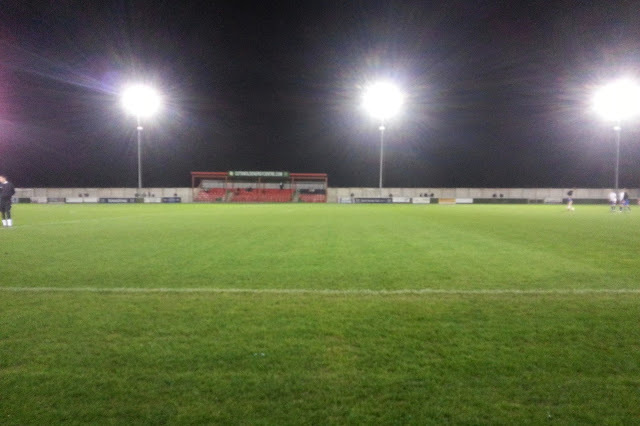 Didcot were still dangerous and Glyn Garner saved a deflected shot with his feet – the ball rebounding to Blenford who shot over under pressure. He was flagged offside anyway. Midway through the half Ellis Dunton (returning from his shoulder injury) and Aidan Bennett replaced Brad Hooper and Steve Davies. In the 70th minute Garner tipped a free kick from Taylor Janes, from the right, over the bar for a left wing corner which was driven into the side netting at the back post. Jon Beeden (also returning after his back injury) replaced Leigh Henry in the 76th minute. A minute later and that man Holland was again in action at the visitor’s end of the pitch as he headed a free kick from the right against the crossbar. Knowing that time was running out to get his hat-trick Chris Holland tried an audacious pot at goal from the half way line as he noticed Beesley off his line, but it sailed wide of the right post. The bar looked pretty smart and modern, also serving Thatchers Gold. I think the food place must have been in there too, but I didn't try anything. They had what looked like a club shop too, just a small range of merchandise, but it was closed on the night, due to the low key nature of the game.